For basic on/off service in process, water, or virtually any application, a ball valve is a common choice. There is, however, another option that should be considered. Coaxial valves are an excellent choice for on/off applications also, and have MAJOR advantages. Read below to learn why a VA Series coaxial valve might be the best choice for your application. 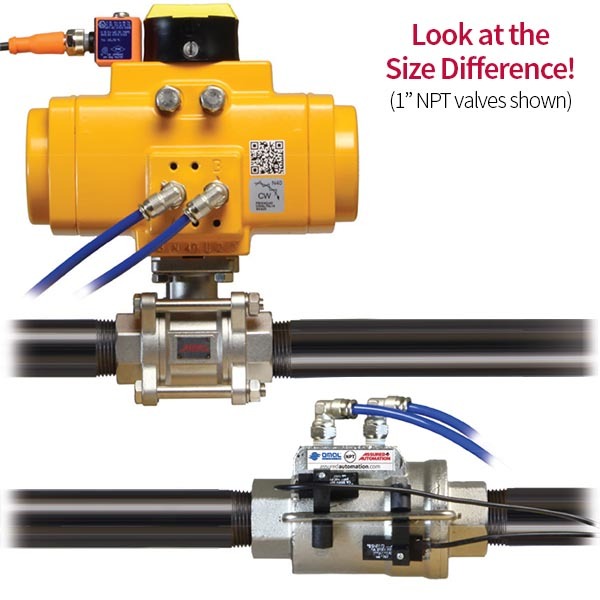 This is an actual size comparison of 1″ NPT ON/Off valves with dual (open & closed) proximity sensor limit switches. The VA series coaxial valve with integral actuator is only slightly larger than JUST THE VALVE in the ball valve assembly. The limit switches are tiny, and attach to a simple bar that clamps on to the valve body using simple set screws. If a solenoid valve is to be used (not shown above) it is a NAMUR mounting interface to maintain the compact streamlined assembly. While the VA valve may be slightly larger than the ball valve equivalent. The fact that it includes the actuator eliminates the additional weight of the rotary actuator needed on a ball valve assembly. This makes it much lighter than an air actuated ball valve of equal size. The volume of air required to actuate the VA series is much less than that needed vs. a ball valve of the same size. The shuttle inside the valve has a relatively short travel distance. The VA series air-operated coaxial valve costs far less than an air-operated ball valve. The savings can be as much as 50% or more. You don’t have the added expense of an actuator, or that of the time and hardware needed to install it. The cost of operation is also less due to the lower volume of air consumed. The higher cycle-life also provides more value. It extends the life of the valve and requires less frequent seal replacement. VA valves have reached 5 million cycles! This saves on replacement seals, maintenance costs, and reduces system down time. There are no external moving parts on the VA coaxial valves. Certain limit switches do move externally on the rotary actuators used in ball valve assemblies. Weight 4.15 lbs. 8 lbs. As you can see in the chart above, there is one disadvantage when using VA series valves. The Cv is much lower. This makes a full-port ball valve a better choice for applications with high flow rates, or where minimal pressure drop is a critical factor. 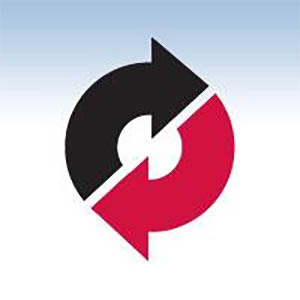 The VA series has a limited selection of seal materials which includes Buna, EPDM, and Viton®. This limits the media that can be controlled to those that are compatible with any of the 3 choices. VA Series air operated coaxial valves are smaller, faster, lighter, and less expensive than typical ball valves with pneumatic actuators. The fast-acting coaxial valves provide over 1,000,000 cycles. This entry was posted in Latest News and tagged Coaxial Valves, VA Series. Bookmark the permalink.